Ringo got interested in modern art. He decided to draw a big picture on the board with N+2 rows and M+2 columns of squares constructed in the venue of CODE FESTIVAL 2017, using some people. The square at the (i+1)-th row and (j+1)-th column in the board is represented by the pair of integers (i,j). That is, the top-left square is (0,0), and the bottom-right square is (N+1,M+1). Initially, the squares (x,y) satisfying 1 \leq x \leq N and 1 \leq y \leq M are painted white, and the other (outermost) squares are painted black. 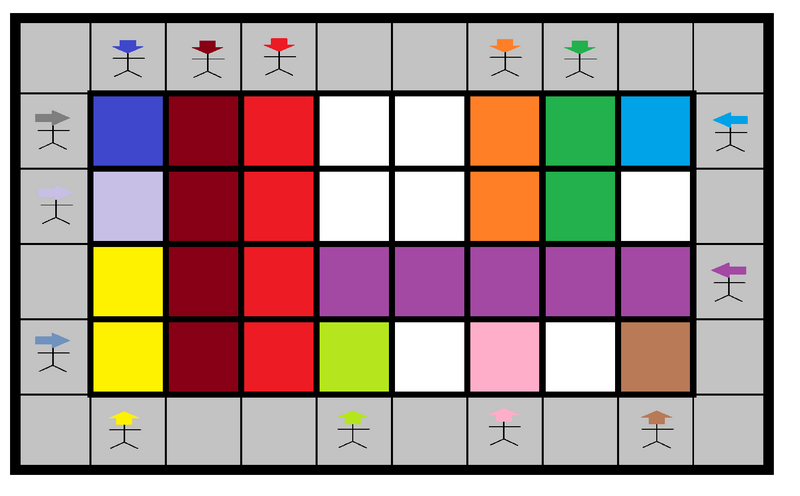 For each row except the top and bottom, if the i-th character (1 \leq i \leq N) in A is 1, place a person facing right at the square (i,0); otherwise, do nothing. 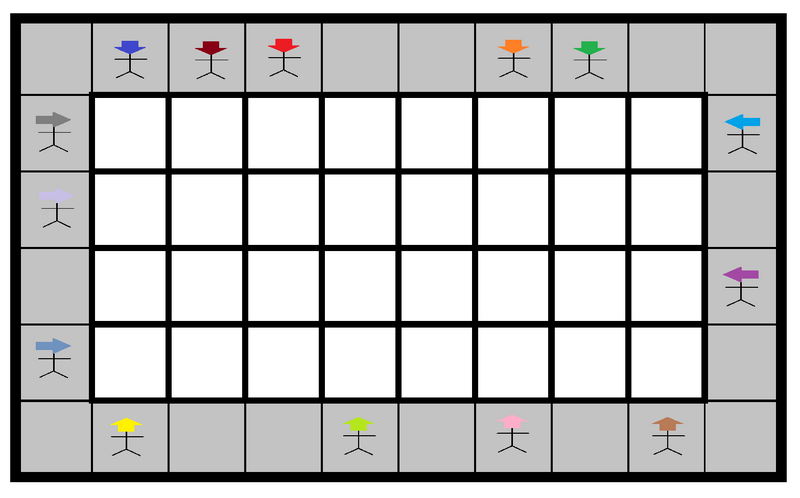 For each row except the top and bottom, if the i-th character (1 \leq i \leq N) in B is 1, place a person facing left at the square (i,M+1); otherwise, do nothing. For each column except the leftmost and rightmost, if the i-th character (1 \leq i \leq M) in C is 1, place a person facing down at the square (0,i); otherwise, do nothing. For each column except the leftmost and rightmost, if the i-th character (1 \leq i \leq M) in D is 1, place a person facing up at the square (N+1,i); otherwise, do nothing. Each person has a sufficient amount of non-white paint. No two people have paint of the same color. Ringo repeats the following sequence of operations until all people are dismissed from the venue. Select a person who is still in the venue. 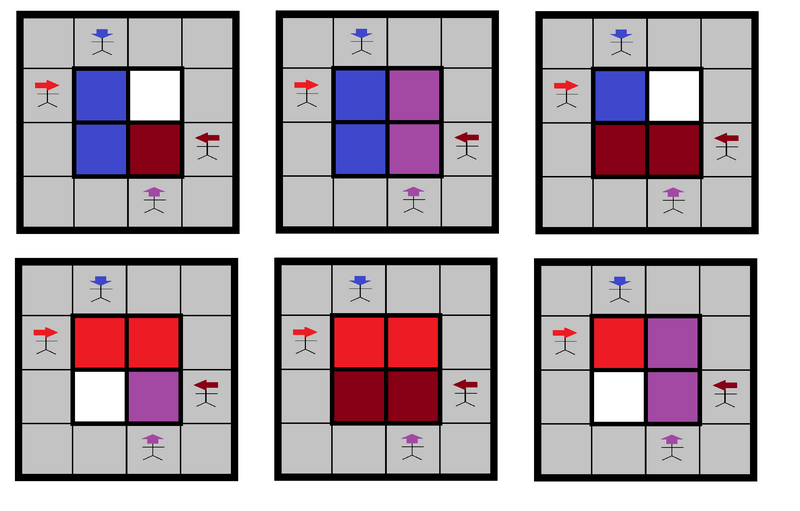 The selected person repeats the following action while the square in front of him/her is white: move one square forward, and paint the square he/she enters with his/her paint. When the square in front of him/her is not white, he/she stops doing the action. The person is now dismissed from the venue. How many different states of the board can Ringo obtain at the end of the process? Find the count modulo 998244353. Two states of the board are considered different when there is a square painted in different colors. A, B, C and D consist of 0 and 1. Print the number of the different states of the board Ringo can obtain at the end of the process, modulo 998244353. There are six possible states as shown below. Be sure to find the count modulo 998244353.